The New York Times has posted a slideshow based on a forecast issued by the Comprehensive Nuclear Test Ban Treaty Organization showing how weather patterns this week might disperse radiation from a continuous source in Fukushima, Japan. Small dots on the map show the position of monitoring stations. 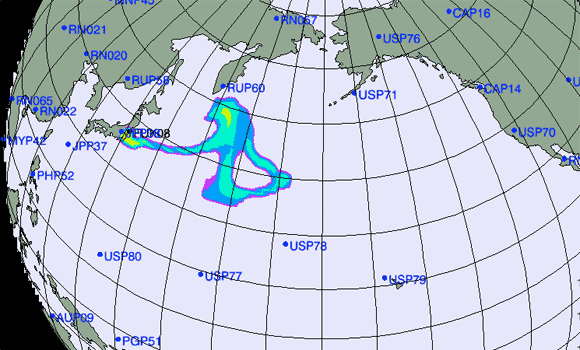 The radiation plume illustrated on the map is from the original release over last weekend. 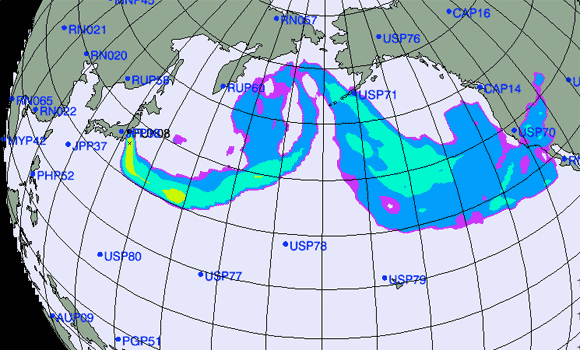 A far larger and more deadly plume of radiation from the explosions and fires earlier this week will soon follow. “The forecast does not show actual levels of radiation,” the Times admits. “Health and nuclear experts emphasize that any plume will be diluted as it travels and, at worst, would have extremely minor health consequences in the United States” (emphasis in the original). As Infowars.com and Prison Planet.com have documented, the U.S. government, the Pentagon, and the Japanese government are all covering-up the actual amount of radiation escaping from the earthquake damaged nuclear plant. It looks like the Comprehensive Nuclear Test Ban Treaty Organization is deliberately releasing misleading information. The CTBTO is an “international organization” associated with the United Nations. 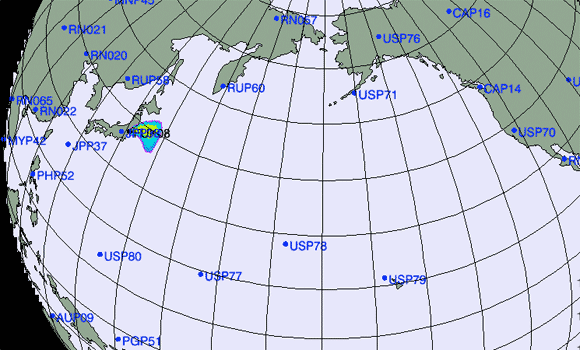 “The projection, by the Comprehensive Test Ban Treaty Organization, an arm of the United Nations in Vienna, gives no information about actual radiation levels but only shows how a radioactive plume would probably move and disperse,” the Times reported yesterday.